There are two ways to give extra credit in Brightspace. The first is to allow the grade item to exceed the maximum number of points for the assignment. The other option is to indicate the grade item is a “Bonus” item. Can Exceed means in grading an item you are able to add extra credit to the assignment, quiz, or any item in the Grade Book. You indicate this by checking the Can Exceed box. The Can Exceed option can boost student’s score on activity making it feasible to earn more than 100%. For example, on a grade item where the maximum points is 10 and the Can Exceed option is selected, a grade of 12/10 is a perfect score with 2 extra credit points added. When you choose Can Exceed for a grade item in the Grade Book, you should also select Can Exceed for the Category in which the grade item resides. Bonus refers to optional activities. Students are NOT penalized for skipping the activity. Points earned for Bonus activities will improve the student’s grade. Checking the Bonus option means that any points earned will be added onto the Final Calculated Grade. Bonus items appear in the Grade Book with a Star next to them. Bonus grade items are not included in the maximum points for a category or final grade. They are added on top of the calculated grade. 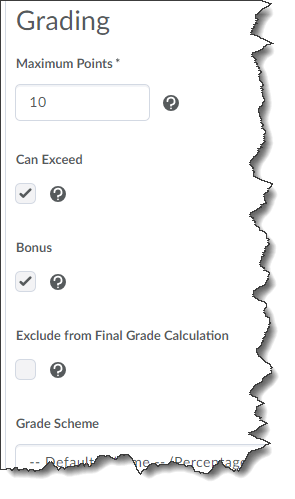 Bonus grade items cannot make users' grades exceed the maximum points specified, unless the Can Exceed option is selected. The Can Exceed and Bonus options can both be selected for a grade item.